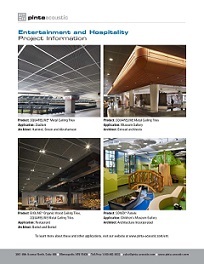 Download or view updated entertainment and hospitality project information >> Examples of acoustical control solutions for entertainment and hospitality projects. This entry was posted in Products, Project Case Studies, Updated Literature and tagged acoustical control, BIOLIONE organic wood ceiling tiles, metal ceiling tiles, SONEX panels, SQUARELINE by pinta. Bookmark the permalink.